When I pull a Tarot card for a message or theme for the day, I especially like to use decks with which I am unfamiliar. This way, I can spend time studying fresh images and attributions before my mind slips into the grooves of old understanding. Yesterday, I picked the Tarot of the Spirit. I was not thrilled when my daily card proved to be the Five of Wind. This is the 5 of Swords in other decks, which often speak to me about mental conflict and biting tongues; in my personal book of Tarot, one of my names for it is "Harpies crapping on your head". In the Tarot of the Spirit, there are the familiar five swords, but they are broken. The background is dark and murky and seems to be crawling with unpleasant things that might become more unpleasant still if you led your imagination dwell on them. The card is tagged "FEAR". My inner skeptic and my gut instinct both rose up in the presence of this card. Though 5 of Swords issues are always a possibility, I downright refused to believe that Fear would be an issue for the day. I scanned my body, my feelings and my sense of where the day was going. No way. Wait. I had somehow managed to leave a card in the pack. I shook it out and found the Father of Fire, equivalent to the King of Wands in other decks. He is depicted here as riding to battle on a great black charger with fiery flanks, lance in hand. Now this is a fellow who knows how to tackle fear, with passion and courage and creative flame. I marked the second card as part of my guidance for the day. In a Tarot reading, as in any other method of divination, it is the slip-ups and "errors" - the cards that fall from the deck or wait in the wings (as in this case) - that let through the pure stream of synchronicity. I had a radio show booked for later that day, with Gary Goldberg, the cultured and spirited host of "In the Spirit" at WRPI. It was a delightful and highly animated conversation. Halfway into the show, Gary asked me if I would read a passage from my book Active Dreaming. He had already selected the excerpt, and directed me to page 177 of my book. The passage continues: "Courageousness is different from fearlessness. If you are fearless, you may be merely crazy or reckless, or lacking in imagination. Courage is the ability to go through fear because you are driven by something that is stronger than fear. Courage is a quality of the heart; you won't find it anywhere else." My morning Tarot was correct: Fear was a theme for the day. And so was the Father of Fire, riding the wind horse of spirit, with the passion that carries us through fear. I met her in this form in a dream: as an African matriarch seated under a baobab tree in the marketplace in her village, with the heaped fruits of the Earth around her. She has made divination marks on the ground with her forefinger according to an ancient system of geomancy. She wears a flowing red garment and the most wonderful multi-colored headgear. She is the quintessential Earth mother. One of my favorite forms of bibliomancy (divination by opening a book) is to pluck an old journal from my shelves or file cabinets, open it anywhere, and see what turns up. Since I have been keeping journals for many decades, there is a vast amount of material to draw from. Sometimes I find that an "old" dream was a preview or rehearsal for events that are manifesting in my life today. When waking events catch up with a dream in this way, the dream may hold more than evidence of long-range precognition; it can offer practical and specific counsel on how to handle a developing situation. An old report may offer a thought for the day, a spur to action, or a reminder of what the soul knows and what the soul needs. It can offer creative fire and inspiration, as I found today. I played my game today with a travel journal from April, 2002. I was excited when the journal sprang open to a page with drawings I had made to illustrate the stages of a journey that I made while drumming for a group during a "Dreamgates" workshop I was leading at the Esalen Institute. 1. I rode the bull/chariot through the face of the Sun. 2. And rose as the bennu/phoenix to the Sun-behind-the-Sun. 3. And ascended to a place of clarity & beauty that looked like a giant eye, suspended in space, from afar. A voice says: "You have found your way back." Since one of my writing themes today is "soul in the multiverse", this came as a welcome reminder of how much is possible when we master the arts of shamanic dream journeying in the cause of connecting with the Greater Self and exploring the larger reality. I did not expect her. She was Chumash. I had heard the word, but knew nothing of her people. She sat drumming under a tree, dressed in blanched skins. She was as real to me as the members of our circle, and much more visible, since the only light in our room was a candle, while in her space - visible to me when my eyes were closed - everything was bathed in white light. I made a mental note to find out about the Chumash later, while I continued drumming for our group journey. Our dream travelers were members of an shamanic circle I have been leading for many years. We had agreed that tonight, we would go through the Tree Gate to a Cave of Paintings like those created by shaman artists in Paleolithic Europe, and by indigenous peoples in North America, Australia and Africa in more recent times. We did not focus on a specific cave, rather on the idea that the images we found painted on the rock walls would help us to enter the Cave Mind: to understand and even participate in the experience these sites were intended to facilitate for those who created and used them. We agreed to touch the painted images and see how going skin to skin might bring the great animals alive. We wanted to see whether the rock walls might yield like membranes, allowing us passage to deeper levels, perhaps to the realm of the Goddess and ancestral wisdom keepers. While drumming for the group, I let my traveling consciousness slip down through the roots of a tree, bent on our assignment. I was surprised to find myself immediately in a verdant and dramatic landscape. Great waterfalls streamed down a giant's staircase, to the watery depths of a gorge far below. A nut-brown Native man, with black hair in a basin-cut, indicated that down there was where I needed to go. It would be a long descent. But I threw off my clothes - I realized that I had been wearing a bear skin - and took the plunge, over the falls, plummeting straight down into the watery depths of the gorge. My body was washed clean by the cool green water. This Cave could be entered only by water, but I had no trouble breathing as I swam down to find the opening. The Native man remained close. The Cave entrance, when I found it, seemed too small for me, just a narrow slit in the rock. But I realized I had changed my body type, and become short and wiry like my new companion. With his mind, he urged me forward, through the crack. For a moment, this world went completely dark. Then I felt movement, and my inner light came on, showing me a writhing mass of snakes, their fangs ready for attack. Was this a trap, or a trial? I willed myself forward, telling myself the snakes could do me no harm, pushing them back like vines or creepers. I came out in a womb-like space. I glimpsed rock paintings, one of them of a huge creature whose shape was unfamiliar. I did not have time to inspect it carefully, because it surged from the wall, filling my field of sight as it presented me with an enormous open maw, easily big enough to swallow me whole. I was reminded of the sandworms in Dune. I briefly considered trying to blow myself up to equal size, in bear form, but rejected this as time-wasting an unnecessary. I chose instead to dive into the mouth of the beast, as you might push an envelope into a mail drop. Utter darkness, churning, willing myself forward. On and on, very far now, it seemed, from the body I had left on the chair, drumming - though I was still in full control of that instrument. At last, my inner light was restored as I came to the first of many doors. They were of many designs, mostly two-leaved doors. I lost count of how many opened before I came out in an airy space suffused by soft blue light. I had the impression of giant feathers, as if a great bird had recently taken flight from this space. A far wall shimmered and became transparent, and through it I saw the vessels used by far travelers who came here, eons ago, to forge a link between higher consciousness and an evolving species on this planet. A luminous intelligence, moving like a blue ripple in the air, gave me a talisman that I recognized: a winged disk. I knew it from different cultures and far memories, especially from Egypt and from Persia. In the form given to me now, the winged disk was unquestionably a vehicle, such as Persian gods and kings were shown riding, powered by xvarnah, radiance. Holding the winged disk, I passed from the place of blue light to a Cave of the Goddess, where fierce warrior women stood ready to challenge but welcomed me when they saw what I was carrying. I received healing and blessing in the realm of the Goddess. Then it was time to bring all of myself back to the body in the chair, and sound the recall signals for all of our group to come back from the places where their dream souls had traveled. Quiet time, when we were all back with the lights on, for drawing and writing from our travels. Then story time, and what excellent stories were shared? Of finding a green world under the shell of a turtle goddess. Of touching the belly of a painted horse and becoming a white stallion, thundering across a plain. Of a Fish Speaker, coming alive from a painted image to deliver the message of Water. Of meeting an Eye Goddess, like one depicted in ancient Anatolia. The professor in me always wants to ground visionary adventures of this kind in research. So I have been looking into the unexpected appearance of the Chumash woman drummer. I find that - previously unknown to me - the Chumash were great rock painters, and a whole cosmology, a star map, and a chart for interdimensional travel may be contained in their Painted Cave near Santa Barbara. A Chumash name for that cave is alahalukin, which means "that which comes around." From the perspective of humans, sun and moon and stars come around, including the big Bear in the sky, Ursa Major, which the Chumash call the Guardian. And so do winged disks, those ancient chariots of the gods. Only a crazy man calls on me. until I brought the roof down. the wind-blown houses across the dark waters. you refused no battle, fled from no fight. the world-behind-the-world you were fighting for. You don't like what you see in the mirror of the water. you cast off your armor. This is taking off your skin. You are so raw a teasing zephyr tears your flesh. You cling to your sword, but the waves rebuff you. To make this crossing, you must lay down your arms. and bury your pride and your rage in forgiving earth. tosses you, hurls you down into stinging sand. and you know that furies you aroused have found you. Is it death you have come to meet at this water gate? you are flat on the far shore, looking up at her lovely face. you would not listen. And still, you are here." you are washed with light. You remember the quest. open like a flower, like a chalice, at your crown." and you let that go, and open. "Drink the light." you have found the Grail, in the one place it can be found. I have been working in a high place, like a hill fort with steep earthen walls, ringed by a deep trench and a wire enclosure. I am excited because I have in my hand the first piece, cast in metal from a very ancient mold. Flat on one side, contoured on the other, it resembles a mounted figure with a great flapping cloth or skin over the horse's body. Yet I think it is more than that; a single being combining elements of horse, human and something beyond what we easily recognize today. I can name this figure. It is "Eshoq". I go to the apertures in the fort and shout down to people below, "This is Eshoq!" holding the figure up, triumphant. Humans and dogs press eagerly forward, staring and sniffing through the wire to see. I woke from this dream excited. I don't recognize "Eshoq" as a name or word, and it doesn't show up right away in an internet search, except (with variant spelling) as a part of others words, such as "foreshock". I have walked the ancient sites of hill forts in Europe, most recently in the Baltic. I have been continuing my researches into the interweaving of gods, animals and humans in early and shamanic consciousness, and am writing about that. I think I have been given another assignment in dream archaeology. Sipping my dream memories, in the midst of the sunlit morning, I remember Jung’s counsel: “If one can stay in the middle, know one is human, relate to both the god and the animal of the god, one is all right. One must remember, over the animal is the god, with the god is the god’s animal.” Yes. 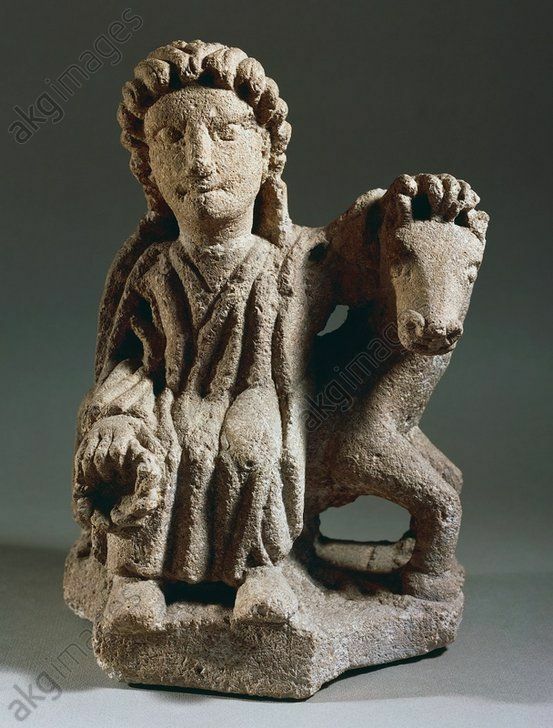 Whatever or whoever Eshoq may be, I think the figurine comes from the realm of mind and being in which god and animal and human are porous to each other and capable of exchanging forms. Image: A Gallo-Roman statue of Epona. Alise-Sainte-Reine, Musée Alesia The head of the Eshoq figurine in my dream is not clearly human. - Antonio Machado, "Last Night as I Lay Sleeping"
of bright fire through my body. I did not even cry out. and told me to get out. that left us safe, but awake. of the white oak that knew you well. surrounded by itself, like a sliding picture. of  joy and of doubt.